Against Your Will tells the story of Gil and Esther Alexander, residents of a religious kibbutz who lost two of their sons to suicide. Few subjects are more taboo than suicide in orthodox Jewish communities — it’s often viewed as an unforgivable sin committed by faithless self-murderers. As they struggle through heartbreak and turmoil, they also work to raise awareness around mental health in Israel’s kibbutzes, where suicide is a growing epidemic. But their honest remembrances of their sons Amit and Yotam is often downplayed or outright dismissed by religious leaders. What inspired you to explore this issue? My grandmother committed suicide before I was born, and no one in my family ever talked about it. In addition, I grew up in a non-religious Kibbutz in a bereaved family (from war, not only suicide), and so the ability to mourn in a closed society was always on my mind. I also served in the same special unit with Amit, and when he committed suicide we all went to his funeral. Before we got on the bus, the unit’s commander told us we must not talk about suicide, as his family was religious and no one must know about it. This was the first time I had heard about the difficulty in talking about suicide in the religious society, and I was shocked. Years later, when I was in film school, I wrote a story about the funeral, and it was published. To my surprise, Gil called me one day and said that a visitor had brought them the story during the shiva for Yotam. I went to meet with Alexanders, and after talking with them I realized I wanted to tell their story. It touched my wounds, and I thought they were wonderful people, as well as great heroes for a documentary. Did you meet any major resistance when making the film? 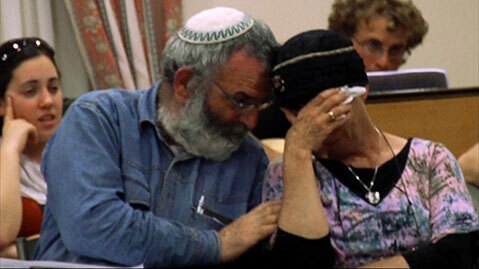 I had a hard time shooting the “extremist” rabbis, who oppose suicide fiercely. They wouldn’t meet me or take part in the film. As a result, the more moderate rabbis were filmed, and they are the ones representing this opposition in the film. In addition, there were a couple of scenes where the people wouldn’t say certain things (names, cases of other suicides) in front of the camera, and would only do so when it was off. There were parts in the long process of making the film when I was very frustrated by this. Why do you think there is what you call an “epidemic” of suicides in kibbutzes? First of all, it is impossible to get accurate data about suicide rates in the religious world. They are often reported as “accidents.” There are, however, certain factors that make suicide more common in small religious communities, such as the kibbutzes: a reticence to participate in psychological treatment, crises of faith, and a strong pressure to excel. What was it like to record the Alexanders in such private and emotionally raw moments? What impact did it have on you? In the beginning, I wasn’t sure whether shooting would eventually yield a film. I promised the Alexanders that if they regretted participating in it, I wouldn’t release the footage. They were very ambivalent about the film, and this calmed them. I also shot only “public” scenes at first, like ceremonies and seminars. The change started after the first joint memorial, where I decided to shoot from outside the fence and honor the occasion. The family appreciated this, and trusted me more. Afterwards the relationship between us grew deeper, and we were almost like family, and still are. The emotional impact on me varied. Sometimes the camera was a buffer and kept me detached from difficult scenes, but sometimes it was hard. There were scenes that left me crying, and their effect remained for days. When I started shooting the film I was single, but by the end I had had children, and it became much harder for me to shoot certain scenes, especially with the Alexanders’ children. What do you hope the film will accomplish? We all hope that the film will make a difference in the way Israeli society deals with suicide, and especially weaken the silence. We also hope that it will stir a discussion in the religious world among kibbutzes and Yeshivas. The first goal was partially achieved (especially after the film was shown on national TV), the second hasn’t yet. I have also hoped that it would give the Alexanders some peace and empathy, which I think it did. What are some practical ways you feel kibbutz suicides could be curtailed or stopped? I think that controlled discussions should be held in kibbutz high schools, under the supervision of psychologists and advisors. There should be seminars and lessons about the causes, effects, and scope of suicide, without religious criticism. Psychologists should be positioned inside kibbutz schools and Yeshivas, and not be under the rabbis’ authority. What surprised you most when making the film? There were certain opinions that I heard about the Alexanders that left me shocked. I won’t even repeat them here, but they included different justifications for the family’s fate. I was also surprised to hear both very tolerant and liberal rabbis, and people who thought quite humanely about certain topics, make very harsh statements about suicide. I found that contradiction hard to understand.